It was big. It was bulky. It was simply OTT. I didn't care for it at first sight. I baulked at the price. "$270 plus? You must be kidding! "I thought. 2 months on, I've learnt to appreciate this Combi Rashule high chair. For one, it is a chair on wheels. Bud goes wherever I am (to the kitchen, to the study) in the comfort of his chair and my hands are free to potter about. It's high so no back-breaking moves for me and the older folks. The back of the chair can be reclined backwards such that it's a sleeping bed (shown in the picture) or upwards -- for a baby as inquisitive as Bud, he sure likes the view. The chair will also slide back and forth in a rocking motion; Bud has caught many a nap in this super chair. 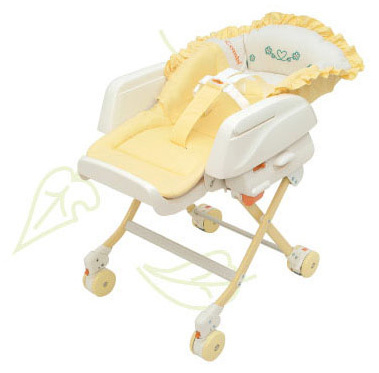 There is a tray (not in pictures) which the baby could use during feeding and the seat cushion can be removed for machine wash.
3) There is a 5-point harness which protects the baby in various stages of growth, which is a plus actually. But I detest using the shoulder straps on Bud -- somehow it reminds me of the infamous picture of Dr. Hannibal in Silence of the Lambs. All in all, I appreciate the convenience this high chair has provided. Bud seems to like it enough and like most babies who get bored easily, he fusses ocassionally to be carried. Would I buy a second unit for home? Very tempting but I am deterred by the hefty price tag.